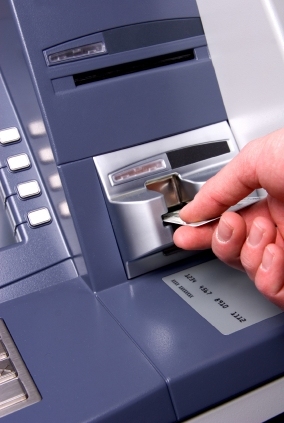 ATM scams have been around for almost as long as ATM's [automated teller machines]have been in existence. Most people use ATM's to some extent for their financial transactions, therefore potentially exposing millions of people to ATM fraud. The most common type of ATM scam is called skimming where a scammer places a device over the ATM card entry slot and reads the information on the magnetic strip when you insert your card. The scammer also conceals a pinhole camera on the ATM to record you entering your PIN. There have also been cases of the ATM being fake - it will appear to process your transaction, but won't dispense any cash to you. There is usually a laptop placed inside to capture your information. Card skimmers and how they work is covered in our page on skimming. In some cases, a transparent plastic overlay on the keypad can record your PIN as it is entered, so don't use keypads with a plastic overlay over them. Once your card information has been copied off the magnetic strip, the scammers can clone the credit or debit cards. The cards are then used to steal money from your account, or make purchases with your cloned card. The low tech type of ATM scams are when people hang around ATMs in order to try to steal your card or withdraw money. They can tamper with the ATM so that your card gets stuck when you try to use it. If you leave your card after entering your PIN they may be able to withdraw cash. Sometimes a 'helpful' person may give advice and tips to help you withdraw the card, including entering your PIN a couple of times. When you give up, they remove the card, and use your PIN they saw you entering. The scammers may work in pairs with one of them 'bumping' into you, and then the other one telling you the person who just bumped into you has stolen your card. If you try to run after them, the second person will then use your card that is still in the machine to withdraw cash, as you have already entered your password. The University of Texas has some photos of the equipment installed for skimming with ATM scams. The scammers use sophisticated technology which is getting harder to detect, so it is not easy to protect yourself. The process of skimming credit card and debit card information does not only occur with ATM scams. Credit card readers at kiosk services and gas pumps can also be targeted for this type of scam. Always regularly check your statement for fraud after every transaction.